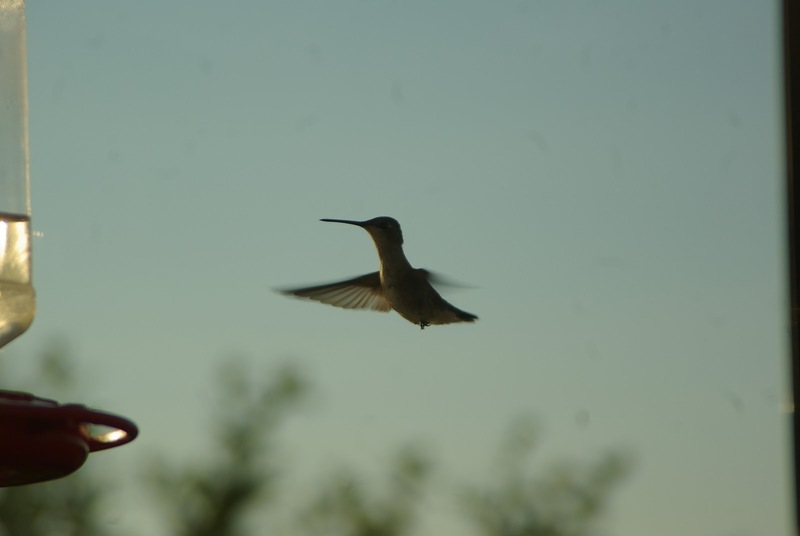 Our little male black-chinned hummingbird has staked out our hummingbird feeder for his missus, and woe unto any other male hummingbird that comes to feed. His female comes to feed, and if another male tries to drive her off, then our male swoops in on the usurper and they engage in quite a martial display. What other creature can turn the tables on our little over-eager male hummie and drive him away? A wasp. Of course, the wasps love the sugar water; they stick their little tongues into the feeder, and enjoy the sweetness. If the wasps are stationed on the feeder, the male hummie will come in and seek a spot away from them. He feeds a little more anxiously than usual, and if the wasps move at all, then away he goes! I am afraid of these small beasts as well. In trying to put fresh sugar water into the feeder, I have the unenviable task of trying to shoo the wasps away and make sure I don’t get nailed by them. They will chase me if disturbed, and the hummie is all too aware of how nasty these creatures are as well. I am disappointed by the wasps’ presence. 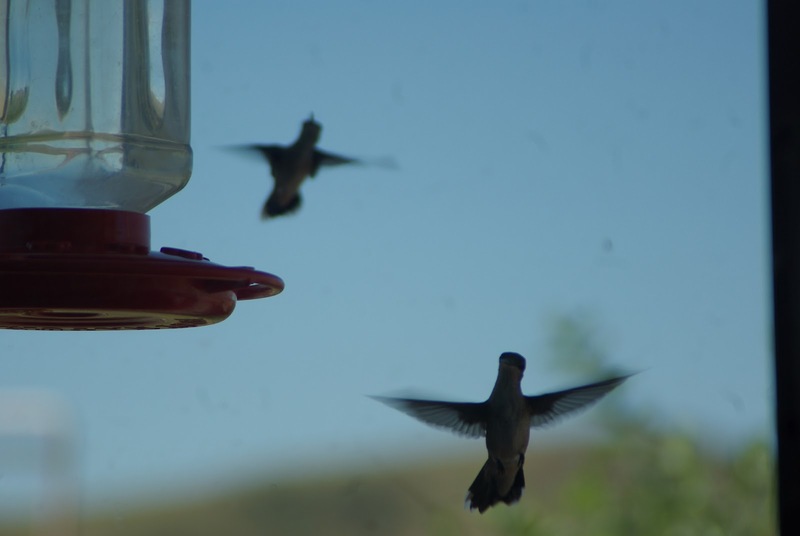 I love watching the hummies fly in and feed, and I admire the male for being so diligent and protective to the female. The way they fly is amazing! They were even able to come to feed during a huge windstorm we had recently. 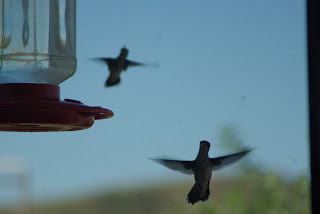 The hummies hung in the air, trying to overcome the wind and land on the feeder. I thought about a 747 airliner trying to navigate a Katrina-sized hurricane…it can be done, but a lot effort goes in to such task! The hummies fought the winds bravely, not letting anything deter them from feeding. So, when the wasps show up and take over the feeder, they are the ultimate party-poopers! The male hummie is still around (not even wasps will drive him completely away) but he doesn’t come to the feeder as often and watching wasps is not nearly as gratifying as watching my hummies! Doesn’t sin act like a wasp on our heart’s feeder? At first, sin alights on us, and we feel we can accommodate sin—sin can “feed” side by side with our lives in Him. It only feeds at one little part of our heart, and we can come and go as we please. We see the sin there and just pick another spot, knowing our hearts are big enough to have both sin and the Spirit in it—at least that’s how we rationalize sin in our lives. Then, over time, we fail to see what the wasp of sin will do--it’s so small, right? Sin will start to drive away the good things in our heart. A wasp is not willing to share with the hummie, despite the rather good-natured response of the hummie—the hummie flies away for a time, waiting for the wasp to finish. But a wasp doesn’t just feed and fly away—it sits on the feeder, and more and more wasps start showing up. Soon, the hummie comes to the feeder less and less—the more sin in our hearts, the less often we listen to the Spirit, and His voice grows fainter and fainter. Soon, the sweetness of His presence is lost in the angry buzz of sin, and we lose His joy in our lives. Our hearts are His most prized possession—why hand it over to the wasps? Heavenly Father: How often do we allow sin to land and start feeding upon our hearts? Oh, it starts out small, but soon more and more sin shows up, driving away Your goodness. We can shoo the wasps away with a confession of our sin and Your sweetness is restored. Keep us on guard for the wasps and let us be diligent to not let even one land on our hearts! Your Word promises us that “If we confess our sins, He is faithful and just, and will forgive us our sins, and purify us from all unrighteousness.” (1 John 1:9) In the wonderful Name of Your Son, Amen.